I've been a resident of Brunswick for quite some time now and for some quite time now I've been aware of a defunct football club by the name of Brunswick Juventus. I've heard bits and pieces about it here and there, but I've never really known a great deal about it. A simple google or wiki doesn't reveal much other than a a list of its titles accompanied by a brief brief history. So on my voyage into the annals of Australian soccer history did I sail and what I found was a book about Brunswick Juventus's history published in 1990 by fan Egilberto Martin titled 'Juve! Juve!'. And while I have a few nitpickings over some lacking of details in the biography/history book—my main bugbear being its lack of details post-1990—I found myself overall ever grateful to Egilberto Martin, a great servant to the club it seems. 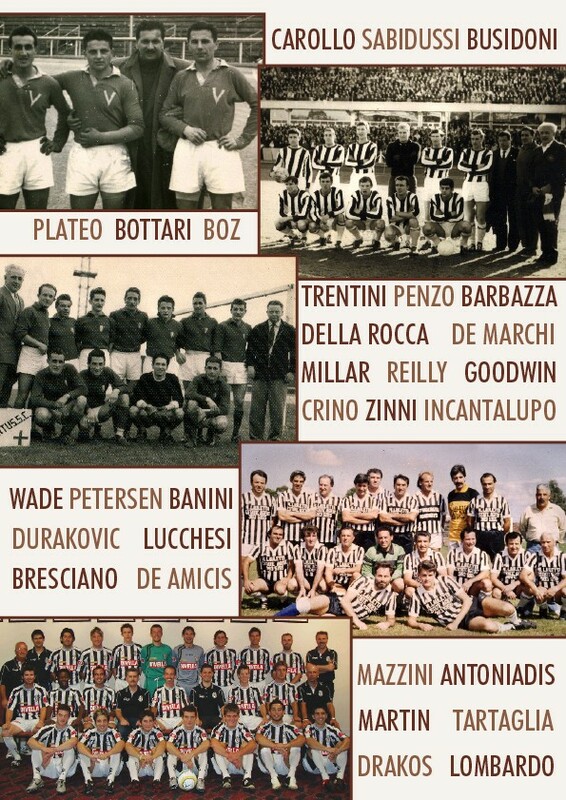 Brunswick Juventus's (known over the years variously as Juventus, Brunswick United Juventus, Brunswick Pumas, and Melbourne Zebras—but I'll just call them by the popularly used Brunswick Juventus) seed was planted sometime in the early 1930s when predecessor club Savoia (Savoy) was established by Italian migrants. This Savoia, who wore light blue shirts and black shorts, was disbanded in World War II. A war in which Italy would side with the Axis powers and in which Australia would send Italian immigrants to internment camps without trial. It was in this war that a Carmelite monk by the name of Agostino Francesco Galanti served as a chaplain in the Italian army. Captured in Libya and sent to a prisoner of war camp in Victoria, Australia, once released he would stay in Australia and become a part of the already established Italian community. Friar Galanti happened to be a monk who loved football and believed that by establishing a community football club that it would offer the youth in the Italian community a healthy and sportive outlet. So he enlisted the services of friend Rino Fontana who had been a member of the earlier Savoia football team. A community meeting gathered in 1948 and the club Juventus was born, named after the great Turin club because of the name's political neutrality (Virtus was also considered), with the club deciding on the main principles of political-neatrality and admission to all regardless of background and town born in (as Italy itself was still a newly uniformed country, with some division still remaining to this day). The early days of the club revolved around heavy running and fitness training and all other assorted methods to get an amateur football club combative, and the club eventually was promoted into the Victorian State Second Division in its third year and then into the First Division in its fifth. In the first season in Division 1 a new coach by the name of Ivan Hrnic took over, it would be this genius technician who'd lead Juventus to glory. Having played in Yugoslavia's top divisions, when arriving in Australia he naturally offered his services as coach to Yugoslavian Melbourne side JUST (Jugoslav United Soccer Team) first, though they rejected him on his inexperience in coaching. Luckily though Brunswick Juventus didn't make the same mistake and hired him as manager for the 1952 season, in which they would be the team to beat, winning 13 games out of 18 matches with the rest draws. They scored 60 goals and conceded 19. Brunswick Juventus would go on to win the next 4 Victorian State Championships in a row, and then again in 1958. They became one of the most hated and envied clubs in the league. Rivalries with Hakoah (Jewish), JUST (Yugoslav), George Cross (Maltese) and others often were bitter and sometimes got violent. On field taunts between players were often racist, melees between fans often required police to break them up, and once a police horse was allegedly stabbed. 1970 was when Juventus won its next State Championship, and that year was arguably its best. In the pre-season the club had sound victories over the champions of the state leagues of both Western Australia and South Australia. Throughout this 22 game season Brunswick won 15 matches, lost 5, and drew 2. They then went to win the Dockerty Cup (the State Cup) and went on a trip to sydney and beat New South Wales State Champions Yugal-Ryde 3-0. The 1970 Juventus side also drew 2-2 with Japanese National Champions Toyo-Kogyo. By now though Juventus were reaching their peak, and despite winning the next two Dockerty Cups, the club was losing players to the wealthier Sydney clubs and faced off-field dramas with the club's treasurer. Incoming Presidents all tried to salvage the situation and turn things around but all failed. First Nino Borsari in 71, then Alberto Alessio in 72, and then Paolo Mirabella in 73 (of the lightbulb store fame) who lasted 4 years and did a good job of keeping the club's books balanced, but brought no glory. And Brunswick Juventus's fortunes sunk further as they missed out on an invitation to the new National Soccer League (NSL), and despite now battling in a much weaker state league, Juventus kept sinking. It wasn't until the early 80s when new club President Bernand Santamaria took to task to save the club from relegation to Division 2. He formed a 'triumvirate' with accountant Greg Icantalupo and Solicitor Dino De Marchi, and together the first thing they did was change coach. They brought in Gastone Boggi and he revitalised the squad with experienced players and veterans. Thankfully they avoided relegation (largely due to a loss overturned into a win after Ringwood City made an administrative error). In 1984 they were finally promoted into the National Soccer League and against expectations they achieved 5th in their first year. The next season although they came 2nd in the table, the Championship in the NSL was decide by a finals competition which resulted in a home and away final with the aggregate winner the national champion. Brunswick played a division final against Preston Makedonia, winning 2-1 (having trailed a goal down most of the match Brunswick scored two late goals to win it), and proceeded to the grand final. Brunswick faced Sydney City and Gabio Icantalupo scored a goal in both legs to bring the aggregate score to 2-0, and Juventus were National Champions. The next season Juventus would finish top of the table (minor premiership) but would be eliminated by Adelaide City 2-0 and by JUST 2-1 in the finals. 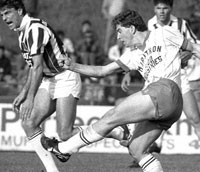 In 1988 Juventus were relegated back to the Victorian State League in which they would remain until 1993. 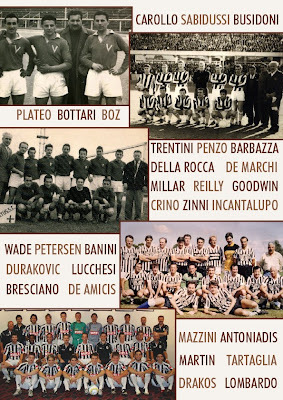 Struggling to stay in the top flight, struggling to attract fans, even those from the Italian community, and amid other concerns the club merged with other Italian ethnic clubs Box Hill Inter and Bulleen Lions to form the Bulleen Zebras, which later merged with the Whittlesea Zebras who now play in the Victorian Premier League. While the Whittlesea Zebras claim descent and history from Brunswick Juventus, the two are separate beings. Juventus is the club which played a roll in the careers of Paul Wade, Mike Petersen, Mehmet Durakovic, and Faust do Amicis. The club had a great youth system and brought up much young talent, though a great majority of the team's lineup for most years were made up of British imports, though they recruited wide with a Brazilian by the name of Jose Cassio da Silva who had played with Pele in the Santos team featuring. It's hard to not over-romanticise the club when it could be argued in reality they were just one community club of many whose achievements in the broad scheme of things (let alone Australia) is few. Their insignificance on the world stage could be exemplified by their 7-0 defeat by Eriksson's AS Roma in a friendly. But it's undeniable that the club has played an important role in the Italian community of Melbourne and the football community of Australia, and it is puzzling that not much else has been written down about the club on the internet.